Solving the last-mile delivery problem is difficult. One approach that is being considered is delivery by drone. Previous OM in the News posts have looked at drone use by Zipline and Doordash. Now, the FAA has conducted a test with a drone out of line-of-sight of the operator. The test: delivering a Popsicle in 6 minutes from a simulated store, to a 2-year-old more than a mile away. The FAA’s drone didn’t land, but instead hovered, and lowered the Popsicle with a tether. Current regulations limit the use of drones to line-of-sight operation. If tests like this one are successful, the line-of-sight limitation might be lifted. 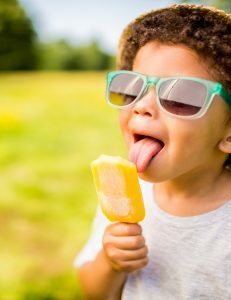 This post is based on the Bloomberg article, Toddler’s Popsicle-by-Air Marks Milestone in U.S. Drone Delivery, by Alan Levin, August 8, 2018; and the Bloomberg video, accompanying Bloomberg video. Image source: wundervisuals/Getty Images. 1. What problems are facing the use of drones for the last-mile-delivery? Guidance: In the US, regulations are part of the problem. The FAA hasn’t approved drones for use beyond line-of-sight. The Popsicle delivery was one test of concept to determine if they should be allowed to operate beyond line-of-sight. Another problem is customer acceptance. We need to consider privacy issues (do you want drones flying over your property? ), and safety issues, such as those raised by the assassination attempt on the Venezuelan president. There is the worry of the drone hitting and damaging something or someone. Should drones be allowed to fly over heavily populated areas? And does the ability to easily receive an item outweigh these concerns? 2. What advantages is provided by drone use for last-mile delivery? Guidance: Convenience and cost savings are the two big advantages. As in this example, having a Popsicle delivered to your house in approximately 6 minutes represents a new level of service. You don’t even have to leave your yard to get your favorite snack or item from a convenience store. Also, the cost of using the drone is very small compared to a delivery vehicle, offering the business tremendous cost savings potential to go with an expanded market. 3. What items are good candidates for drone delivery? Guidance: In general you would look at items that are smaller (and lighter), of relatively high value or high profit, and customers demand them instantly. The Popsicle could be classified as an impulse item that people don’t plan ahead for, but want it immediately. Medicines could be another good fit, especially for individuals who have difficulty leaving their home. Small parts from a hardware store to help with a repair could be another. The potential list is quite large.